"Discus thrower" and "Discus" redirect here. 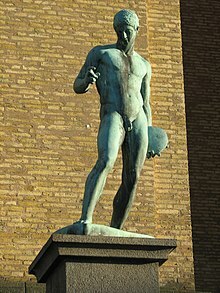 For the statue, see Discobolus. For other uses, see Discus (disambiguation). German 2012 Olympic champion Robert Harting. The discus throw ( pronunciation) is a track and field event in which an athlete throws a heavy disc—called a discus—in an attempt to mark a farther distance than his or her competitors. It is an ancient sport, as demonstrated by the fifth-century-BC Myron statue, Discobolus. Although not part of the modern pentathlon, it was one of the events of the ancient Greek pentathlon, which can be dated back to at least to 708 BC, and is part of the modern decathlon. 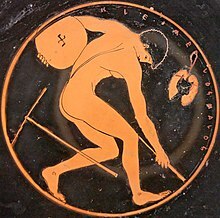 The sport of throwing the discus traces back to it being an event in the original Olympic Games of Ancient Greece. The discus as a sport was resurrected in Magdeburg, Germany, by Christian Georg Kohlrausch and his students in the 1870s. 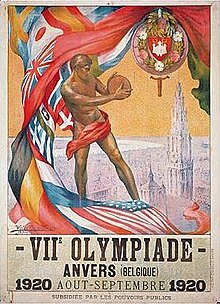 Organized Men's competition was resumed in the late 19th century, and has been a part of the modern Summer Olympic Games since the first modern competition, the 1896 Summer Olympics. Images of discus throwers figured prominently in advertising for early modern Games, such as fundraising stamps for the 1896 games, the main posters for the 1920 and 1948 Summer Olympics. Today the sport of discus is a routine part of modern track-and-field meets at all levels, and retains a particularly iconic place in the Olympic Games. The first modern athlete to throw the discus while rotating the whole body was František Janda-Suk from Bohemia (present Czech Republic). He invented this technique when studying the position of the famous statue of Discobolus. After only one year of developing the technique he earned a silver medal in the 1900 Olympics. Women's competition began in the first decades of the 20th century. Following competition at national and regional levels it was added to the Olympic program for the 1928 games. The men's discus is a heavy lenticular disc with a weight of 2 kilograms (4.4 lb) and diameter of 22 centimetres (8.7 in), the women's discus has a weight of 1 kilogram (2.2 lb) and diameter of 18 centimetres (7.1 in). Under IAAF (international) rules, Youth boys (16–17 years) throw the 1.6 kilograms (3.5 lb) discus, the Junior men (18–19 years) throw the unique 1.75 kilograms (3.9 lb) discus, and the girls/women of those ages throw the 1 kilogram (2.2 lb) discus. In international competition, men throw the 2 kg discus through to age 49. The 1.5 kilograms (3.3 lb) discus is thrown by ages 50–59, and men age 60 and beyond throw the 1 kilogram (2.2 lb) discus. Women throw the 1 kilogram (2.2 lb) discus through to age 74. Starting with age 75, women throw the 0.75 kilograms (1.7 lb) discus. The typical discus has sides made of plastic, wood, fiberglass, carbon fiber or metal with a metal rim and a metal core to attain the weight. The rim must be smooth, with no roughness or finger holds. A discus with more weight in the rim produces greater angular momentum for any given spin rate, and thus more stability, although it is more difficult to throw. However, a higher rim weight, if thrown correctly, can lead to a farther throw. A solid rubber discus is sometimes used (see in the United States). To make a throw, the competitor starts in a circle of 2.5 m (8 ft 2 1⁄4 in) diameter, which is recessed in a concrete pad by 20 millimetres (0.79 in). The thrower typically takes an initial stance facing away from the direction of the throw. He then spins anticlockwise (for right-handers) around one and a half times through the circle to build momentum, then releases his throw. The discus must land within a 34.92-degree sector. The rules of competition for discus are virtually identical to those of shot put, except that the circle is larger, a stop board is not used and there are no form rules concerning how the discus is to be thrown. The basic motion is a forehanded sidearm movement. The discus is spun off the index finger or the middle finger of the throwing hand. In flight the disc spins clockwise when viewed from above for a right-handed thrower, and anticlockwise for a left-handed thrower. As well as achieving maximum momentum in the discus on throwing, the discus' distance is also determined by the trajectory the thrower imparts, as well as the aerodynamic behavior of the discus. Generally, throws into a moderate headwind achieve the maximum distance. Also, a faster-spinning discus imparts greater gyroscopic stability. The technique of discus throwing is quite difficult to master and needs lots of experience to get right, thus most top throwers are 30 years old or more. The discus technique can be broken down into phases. The purpose is to transfer from the back to the front of the throwing circle while turning through one and a half circles. The speed of delivery is high, and speed is built up during the throw (slow to fast). Correct technique involves the buildup of torque so that maximum force can be applied to the discus on delivery. During the wind-up, weight is evenly distributed between the feet, which are about shoulder distance and not overly active. The wind-up sets the tone for the entire throw; the rhythm of the throw is very important. Focusing on rhythm can bring about the consistency to get in the right positions that many throwers lack. Executing a sound discus throw with solid technique requires perfect balance. This is due to the throw being a linear movement combined with a one and a half rotation and an implement at the end of one arm. Thus, a good discus thrower needs to maintain balance within the circle. For a right handed thrower, the next stage is to move the weight over the left foot. From this position the right foot is raised, and the athlete 'runs' across the circle. There are various techniques for this stage where the leg swings out to a small or great extent, some athletes turn on their left heel (e.g. Ilke Wylluda) but turning on the ball of the foot is far more common. The aim is to land in the 'power position', the right foot should be in the center and the heel should not touch the ground at any point. The left foot should land very quickly after the right. Weight should be mostly over the back foot with as much torque as possible in the body—so the right arm is high and far back. This is very hard to achieve. The critical stage is the delivery of the discus, from this 'power position' the hips drive through hard, and will be facing the direction of the throw on delivery. Athletes employ various techniques to control the end-point and recover from the throw, such as fixing feet (to pretty much stop dead), or an active reverse spinning onto the left foot (e.g. Virgilijus Alekna). Sports scientist Richard Ganslen researched the Aerodynamics of the Discus, reporting the discus will stall at an angle of 29°. 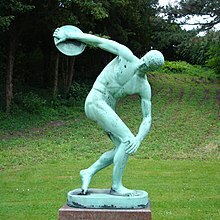 The discus throw has been the subject of a number of well-known ancient Greek statues and Roman copies such as the Discobolus and Discophoros. The discus throw also appears repeatedly in ancient Greek mythology, featured as a means of manslaughter in the cases of Hyacinth, Crocus, Phocus, and Acrisius, and as a named event in the funeral games of Patroclus. Discus throwers have been selected as a main motif in numerous collectors' coins. One of the recent samples is the €10 Greek Discus commemorative coin, minted in 2003 to commemorate the 2004 Summer Olympics. On the obverse of the coin a modern athlete is seen in the foreground in a half-turned position, while in the background an ancient discus thrower has been captured in a lively bending motion, with the discus high above his head, creating a vivid representation of the sport. In U.S. high school track and field, boys typically throw a discus weighing 1.6 kg (3 lb 9 oz) and the girls throw the 1 kg (2.2 lb) women's discus. Under USATF Youth rules, boys throw the 1 kg discus between the ages of 11–14, and transition to the 1.6 kg discus as 15- to 18-year-olds. Girls throw the 1 kg discus as 11- to 18-year-olds. Under US high school rules, if a discus hits the surrounding safety cage and is deflected into the sector, it is ruled a foul. In contrast, under IAAF, WMA, NCAA and USATF rules, it is ruled a legal throw. Additionally, under US high school rules, distances thrown are rounded down to the nearest whole inch, rather than the nearest centimetre. Correct as of July 2017. Ben Plucknett also threw a world record of 72.34 on 7 July 1981 in Stockholm, but this performance was annulled due to doping offense. Rickard Bruch also threw 72.18 on 23 July 1974 at an exhibition meeting in Piteå. John Powell also threw 72.08 on 11 September 1987 in Klagshamn, but the throw was made onto a sloping/downhill sector. Kamy Keshmiri threw 70.84 on 27 May 1992 in Salinas, but this performance was annulled due to doping offense. Gabriele Reinsch also threw 74.44 m (1988), 73.42 m (1988). Ilke Wyludda also threw 74.40 m (1988), 73.04 m (1989). Diana Sachse also threw 73.90 m (1987), 73.32 m (1987), 73.26 m (1986), 73.24 m (1987), 73.04 m (1987), 72.94 m (1988). Daniela Costian also threw 73.78 m (1988). Galina Savinkova also threw 73.26 m (1983), 72.96 m (1985). Darya Pishchalnikova of Russia threw a best of 70.69 in Cheboksary on 5 July 2012, but this performance was annulled due to doping offense. ^ "Sports - List of Summer and Winter Olympic Sports". olympic.org. 14 January 2018. ^ Cappos, Scott. "Shot Put and Discus Technique and Training". Digital Track and Field. ^ a b throwhammer (13 September 2010). "wyludda discus throw 1996 olympics" – via YouTube. ^ ntujavelin (26 December 2008). "2005 World Championship Men's Discus - 1st Virgilijus Alekna" – via YouTube. ^ Discus Throw - men - senior - outdoor. IAAF. Retrieved on 2014-01-20. ^ Discus Throw - women - senior - outdoor. IAAF. Retrieved on 2014-01-20. ^ Jon Mulkeen (29 June 2017). "Stahl breaks Swedish discus record with world-leading 71.29m". IAAF. Retrieved 29 June 2017. ^ Diego Sampaolo (19 July 2017). "Perkovic throws 71.41m in Bellinzona, world's best discus mark since 1992". IAAF. Retrieved 19 July 2017. ^ "Denia Caballero sets Discus world lead of 70.65, Pichardo debuts in long jump". watchathletics.com. 21 June 2015. Retrieved 21 June 2015. ^ Day 2 of IOC Executive Board meeting in St. Petersburg . Olympic (2013-05-30). Retrieved on 2014-04-19. 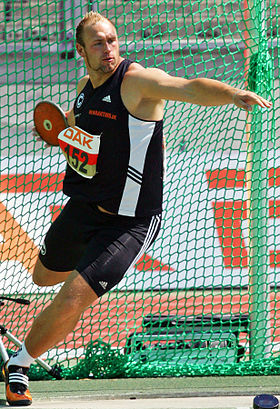 Wikimedia Commons has media related to Discus throw.